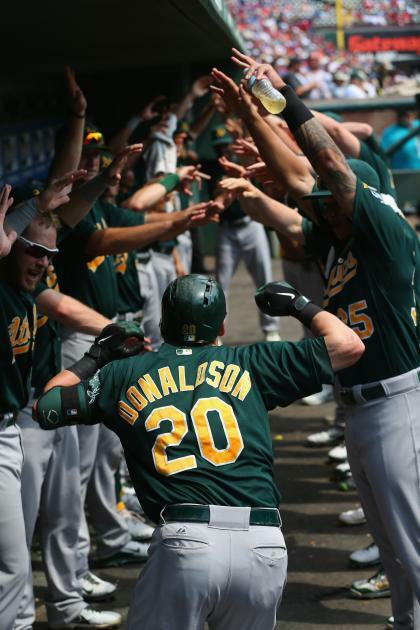 ARLINGTON, Texas – Josh Donaldson had dinner with his father Saturday night and, he said, "it was fine." See, Levon Donaldson had done time for drug offenses and domestic abuse. He'd been away for 15 years, which was one way to frame the sentence. Another was, most of his son's youth. By the time Levon was free, Josh was no longer swinging a plastic bat in the backyard. He was a professional ballplayer. And when Levon found his seat Friday night at Rangers Ballpark for the first game he'd ever see Josh play, his boy was a grown man, the best player for the Oakland A's, and a guy who'll find himself on a fair number of American League MVP ballots. As parenting goes, that's quite a gap. So Josh for the better part of his life leaned on his mother, a strong and wonderful woman named Lisa French, and she on him, which is how tough folks survive the tough times. "Everybody's going to have their own story," Josh said Sunday morning. "I never wanted to use that as a crutch. For the mistakes my father made, the time he spent away, I know that he wished he could make it right." Right or wrong, the rest was up to Josh. "Where people may want to go negative with it," he said, "I look at it as a positive." He put his head down, played ball, figured it out a pitch at a time. By the time he had, or was as good at it as he'd ever been, his dad was up there, looking down, watching – perhaps understanding – where the years had gone. By Sunday afternoon, Josh had homered for the second time in three games and for the 23rd time in the season he had to have. He's 27 and until he became the A's opening day third baseman five months ago was spending some of his prime trapped between Triple-A and the big leagues. On a particularly hot day in Fresno last summer, A's player personnel director Billy Owens waved over Donaldson. "Josh, I need to talk to you," he said. Donaldson hadn't hit in Oakland. He'd returned to the minor leagues. He went back to Oakland and didn't hit again. And now he was back, and hitting like Triple-A was too easy again. "Why," Owens asked him, "can't you do that in the big leagues?" Donaldson had asked himself that plenty. For whatever reason – maybe it was Owens' bluntness, maybe it was the challenge he needed, maybe it simply was his time – Donaldson did take one more trip to Oakland, and he did answer Owens' question. From the middle of August to the end of the season Donaldson hit .290, homered eight times and doubled 11 times in 176 at-bats. He hit .294 over five games against the Detroit Tigers in the division series. Third base his, and a regular place in the lineup his, Donaldson has ridden the routine and become a reliable, productive player. His best month has been September, at a time the A's overtook and ran away from the Texas Rangers. Among American Leaguers, only Miguel Cabrera and Jhonny Peralta hit for higher averages against left-handed pitchers. True to that, Donaldson picked out a first-inning, one-strike curve ball Sunday against Rangers lefty Martin Perez and hooked it into the left-field seats. He'll carry a .302 batting average into the season's final two weeks. "When he said that to me, I don't know, but it made sense," Donaldson said. "Why couldn't I do it?" Donaldson does seem every bit the tough kid grown up. His eye contact is resolute. When Yu Darvish appeared to take issue with something Donaldson said or did Saturday afternoon and fixed him with a glare from the mound, Donaldson would not look away until Darvish had. He'd worked too hard and cared too much to be pushed around. This, he seemed to say, is as much my time as yours, as anyone else's. "When he's on the field," A's hitting coach Chili Davis said, "he don't give a crap what you think about him. He's competing." By late afternoon here Sunday, the A's had swept the Rangers, and they'd pushed their lead in the AL West to 6½ games with 13 games left, the next seven in Oakland. Clubbies hauled green duffels loaded with gear to a truck, and hoisted them into the cargo area. A few feet away, Levon Donaldson watched them come and go. Josh came out and they said their goodbyes after a weekend well spent. Josh returned to the clubhouse. Levon walked the concourse, a baseball in his left hand. It's been quite a year for them both. But, happily ever after? Josh grinned. It's not that easy. Nothing's that easy. "That's the way I feel about it right now," he said. "The past is the past. I'm sure he feels that way too."